Turtle Beach is a company we PC builders are all familiar with. The best competition Creative ever had in the sound card space, Turtle Beach has been making quality computer audio parts since the mid-90’s. But with the advent of integrated audio on motherboards now rivaling sound card quality, the audio company needed a new market. Recently, Turtle Beach’s venture into the lucrative market of gaming headsets has worked wonders for them. 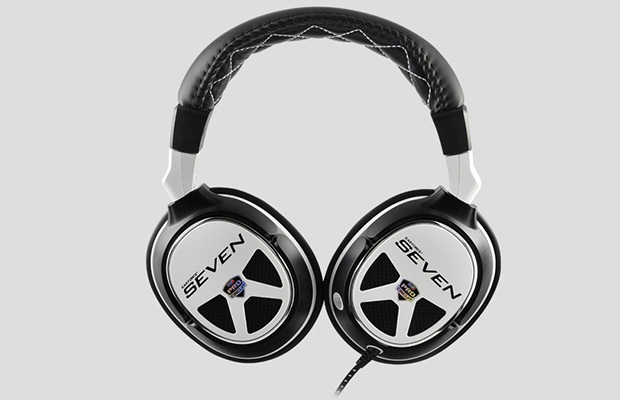 But is the new XP Seven series headset worth the investment? Yes and no. Upon opening the surprisingly large package, you’re greeted with a plethora of cables and plastic bits. Setting up the device for use on a PlayStation 3 was tricky, with the documentation not as clear as I would’ve liked. Once set up, and the device selected within the PS3’s software, the cans were ready to rock; though they didn’t rock as much as I was hoping. The sound quality is very good in stereo mode. Electronic music has that nice crispness to it that you’d expect. Hearing George’s guitar in “While My Guitar Gently Weeps” sounded about as close to perfect as that recording could get. Even using the headphones with my amplifier and playing guitar, these cans kept up with a surprisingly decent high and middle end to them. However, when the headphones are connected to the box that enables surround sound, things start to falter. Putting in a 5.1 mix of the Beastie Boys’ “Hot Sauce Committee Pt. 2,” the headphones failed to replicate certain signals that I know existed in the stereo mix. Listening to the same 5.1 mix on my loudspeakers, I was able to hear the missing elements. The same went for the 5.1 mix on Saving Private Ryan. Expecting to hear bullets whizz past my face during the opening scene, I was disappointed to hear a lack of volley and death surrounding my head. In games, though, the surround sound was a revelation. I didn’t realize that you could hear Snake breathe in Metal Gear Solid 4 after he ran around a bit. The volley and bullets that were missing in Private Ryan were ever present in MGS4. The crunch of the snow was crisp and clear as day, adding so much to a game that was already immersive as-is. The headphones sit nice and tightly on the head, though if you wear glasses like I do, expect some fatigue after an hour or so of use. I feel like if the set fit looser, though, it’d ruin the seal and diminish audio quality and allow for background noise to interfere. It’s a trade-off, and I’d rather have a great seal and a fifteen minute break, than total comfort and my loud neighbors’ vacuum running. For $250, though, I feel like this set should be wireless. As it is, it’s great for a dorm room set-up or if you’re in a competitive games tournament where your screen and console are near you. But for folks wanting to integrate this system into their living room, it doesn’t cut it. The sheer amount of cables involved in setting up the surround sound, coupled with their moderate reach, just won’t work stretching to the couch. They’re pricey, they have a lot of cables, and they’re not the best if you’re indulging in a lot of music or movies. But if you’re willing to look past that, or those aren’t factors in your situation, the XP Seven is a great choice for games.